My many years of experience working in international development have taught me many things. One of the most important is that cooperatives are an underused powerful engine for greater equity and greater prosperity. It is a development approach that really works! So when I learned that farmers in malt barley cooperatives in some parts of Ethiopia were side-selling, I knew something was wrong. Approximately 4.5 million Ethiopian farmers – most in Central Ethiopia — produce malt barley, an essential ingredient in beer. Although Ethiopia drinks much less beer than many other countries, it is the second largest producer in Africa, and 12 big brewers, such as Heineken and Diageo, have breweries there. Malt barley cultivation is growing at an estimated 24% annually. The cooperatives play a key role: they aggregate farmers’ production, negotiate with big buyers, increase member incomes and overall secure the smallholder place in the value chain. Yet, despite learning that farmers really value the technical assistance and inputs that they receive from cooperatives, we learned also that some 66% of members do some side-selling. To fix it we have to know why they are side-selling. But with different, often conflicting stories as to why it was happening, we decided to take a deeper look. Partnering with Self-Help Africa, we found both bad news (problem confirmed!) and good news (problem fixable!). Lack of Trust: Cooperatives do not work well if there is limited trust. Lack of understanding about pricing strategy, longstanding trade relationships outside their cooperatives and limited transparency in quality assessment eroded the side-sellers’ trust in the cooperative. And since it takes “two to tango,” cooperatives tended to mistrust the farmers simply for their side-selling. Inconvenient Point of Sale: One of the main reasons for Ethiopian farmers decide to engage in side-selling has to do with where their crop is purchased. They do not want to and often are not able to incur costs of transportation to a distant point of sale. They want a “farm gate” purchase, which the cooperatives are often unwilling to give – for the same reasons as the farmers. They do not have the capacity or financing to travel to each farm. Inconvenient Time of Sale: Farmers usually need cash! And they want it right after harvest. There is a built-in “catch 22” with the cooperatives as they often are not able to buy all of the product at the same time due to liquidity issues. Similarly, many cooperatives want to defer buying to get better prices for the farmers by going to market in a staggered way. Uneven Quality Assessment: It goes without saying that better quality usually commands better prices. So this is also true for malt barley in Ethiopia. However, there is not a uniform, objective and transparent process for the way quality is assessed. Gaps in Capacity and Skills: Neither the farmers nor the cooperatives have the right skill sets and experience, or the resources, to iron out all their problems on their own. Our research shows many ways that the incentives for side-selling can be addressed. Some of these are expensive and may take a long time–such as finance for storage facilities or a credit facility giving the cooperative the ability to purchase more flexibly. However, there are shorter-term solutions as each of the issues can be at least partly resolved through better communications – bringing the right people together (cooperatives, farmers, others in the value chain) to discuss their concerns, listening to them, jointly problem solving, and clarifying roles and expectations. 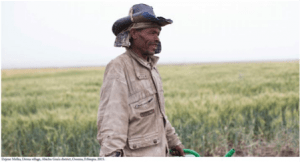 Cooperatives and those supporting them are now using this research to help Ethiopian farmers seize the malt barley opportunity for economic security. See the full study, co-funded by OCDC under the USAID Cooperative Development Program (CDP) and by Self-Help Africa. Judith Hermanson is the Research Director of OCDC, an association of cooperative development organizations where she previously served on the Board and twice as its Chair. As Research Director, she leads OCDC’s research activities that seek to develop evidence about the effectiveness of the cooperative development business model and to enhance learning to improve program design and impact. Her career in international development includes leadership roles in several international cooperative development, US civil society, and academic organizations. She has worked in 50+ countries in Africa, Asia, Latin America, the Middle East, Europe and the US, providing hands-on technical assistance and policy advice. This post was originally published on April 4th 2018 on Market Links.